Hansel & Gretel: Witch Hunters (2013) is an action-horror-fantasy movie with a twist from the original folk fairy tale "Hansel and Gretel". 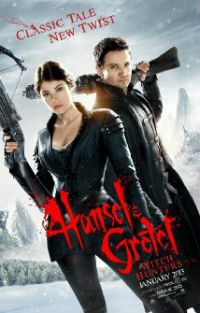 Synopsis: Witch hunters Hansel (Jeremy Renner) and Gretel (Gemma Arterton) are in the village of Augsburg where children are abducted by wicked witches. Grand witch Muriel (Famke Janssen) needs the children during the Blood Moon to carry our her evil plan. Hansel and Gretel have to stop her before it's too late. "Blood and gore and action, all the stuff that I love... It's definitely an R-rated movie, the first draft has a lot of blood and guts. First and foremost, it's an action movie, I think, with horror elements. And of course some dark humor as well. But the action and horror are the most important feelings I want." "I loved fairy tales growing up. I used to listen to them on tapes and 'Hansel & Gretel' scared the hell out of me and it always stayed in the back of my head. I always wondered what happened to those characters." "I have a strong memory from my childhood of just how dark and gruesome their tale was and I wondered what would have happened to the two of them when they grew up? They had this dark past and this intense hatred of witches. So as I thought about it, it made sense to me that of course they would be fated to become great witch hunters. We wanted it to feel like this could be happening 300 years ago but at the same time, there is a modern spin on all the action, characters and weaponry. It was a fun way to make a classical world feel fresh." Well, in my opinion, there's not much of a storyline to talk about. Almost every scene is about intense action, swearing, hunting down and killing those bloody witches in one way or another. But the visual effects are really fantastic though. At the end of the movie, my deepest impression is how Jeremy Renner and Gemma Arterton run everywhere in some steam-punk-ish clothes while toting sinister-looking weapons. Not too bad if you enjoy every bit of the action parts. Apart from that, sad to say, there's nothing much to shout about.